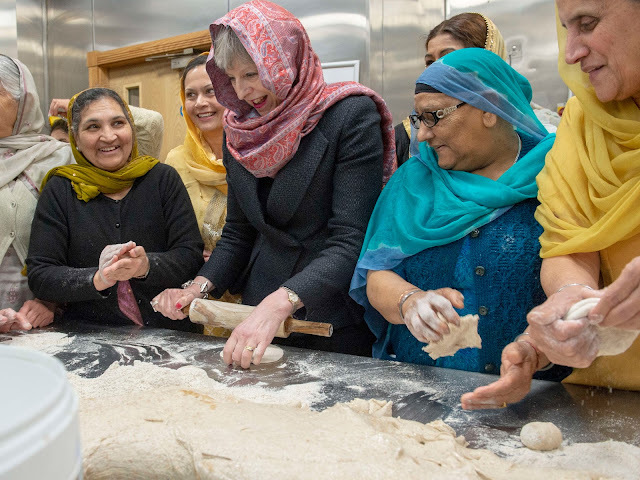 From the West Midlands to London, here's a recap of Theresa May's week. 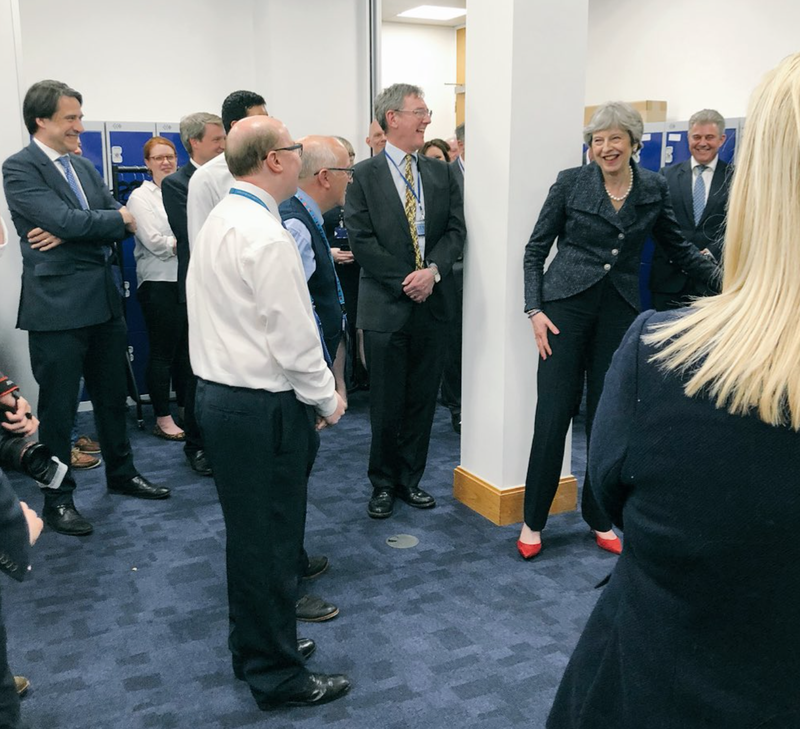 On Monday, the Prime Minister visited Boss Designs in Dudley as part of a visit on the local election campaign trail. 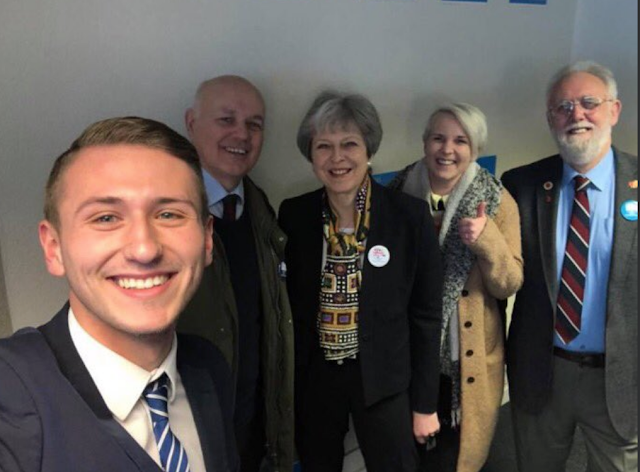 Later in the day, the PM met with party activists. For this visit, May wore her pale blue blazer, teaming it with black trousers, the Divine jewelled flats from Russell & Bromley and an oversized pearl necklace. 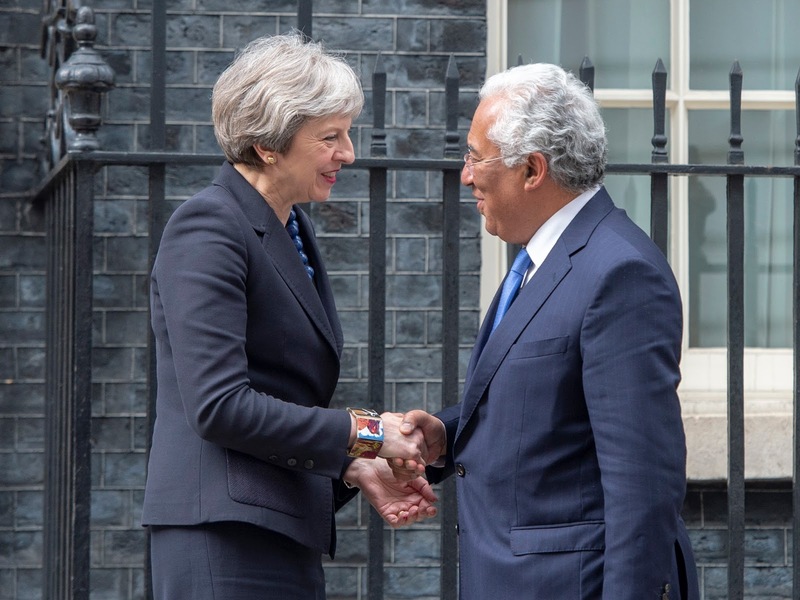 On her return to London, the PM attended a 25th anniversary memorial service for Stephen Lawrence at St. Martin's in the Fields. 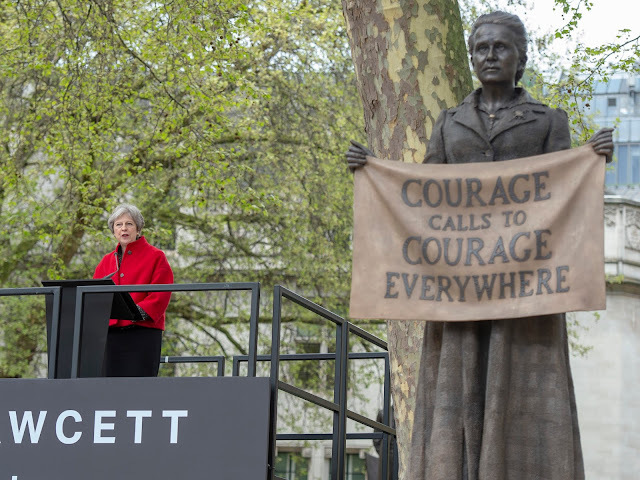 May switched from pale blue to her textured black jacket from Daniel Blake. 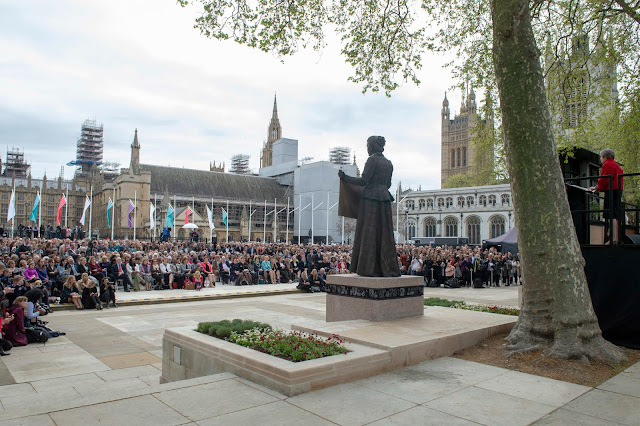 On Tuesday, May attended the unveiling of the Millicent Fawcett statue in Parliament Square. 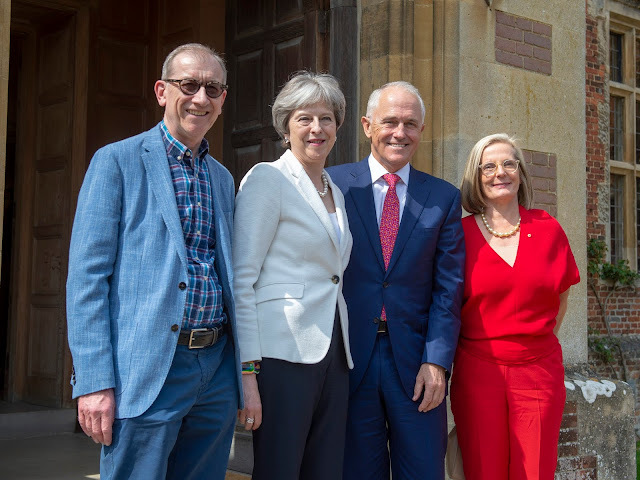 The PM stood out from the crowd in a black skirt and red Piazza Sempione jacket. 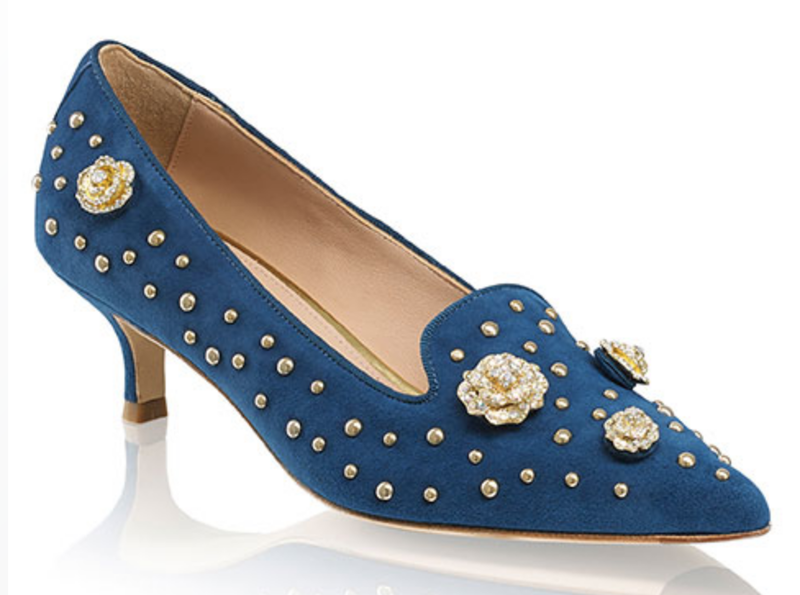 Our favourite leopard Kitty kitten heels from Charlotte Olympia made a reappearance! On Wednesday, the PM took part in Prime Minister's Questions and visited activists at CCHQ. Her new navy jacket with silver sparkle from Daniel Blake was her outfit of choice, teaming it with black trousers and the Audrey red suede kitten heels from LK Bennett. 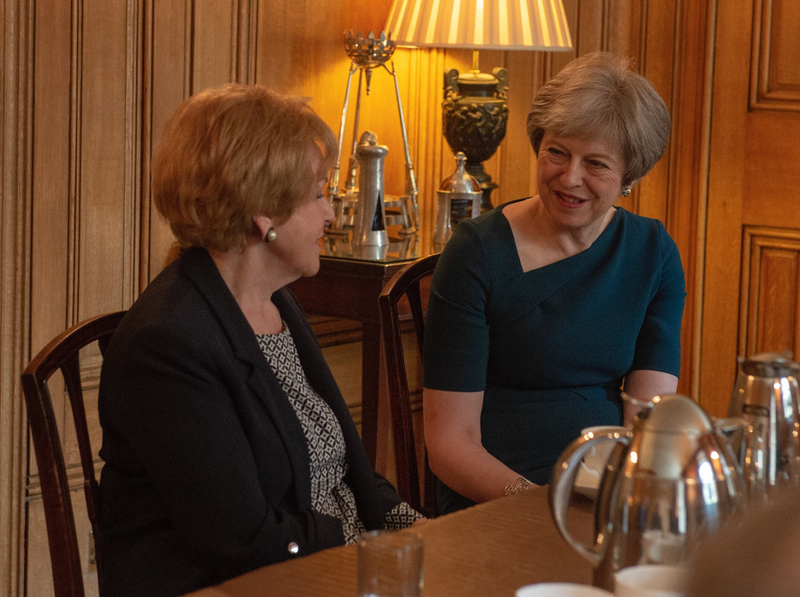 On Thursday, the PM welcomed Holocaust survivor Mala Tribich to Number 10. 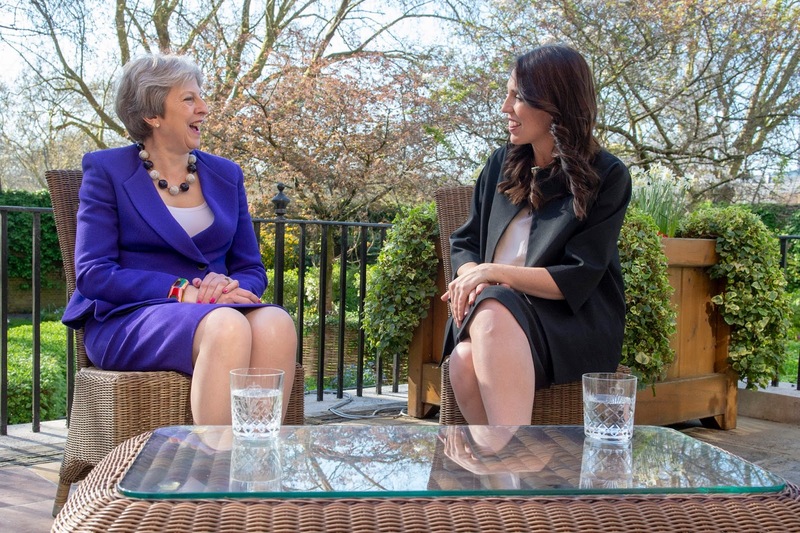 Later in the day, May welcomed Azerbaijan's President Ilham Aliyev to Downing Street. May wore some of the classics - the Saskia Evergreen dress by LK Bennett, her tweed jacket from DvF and the oversized silver chain necklace from Amanda Wakeley. 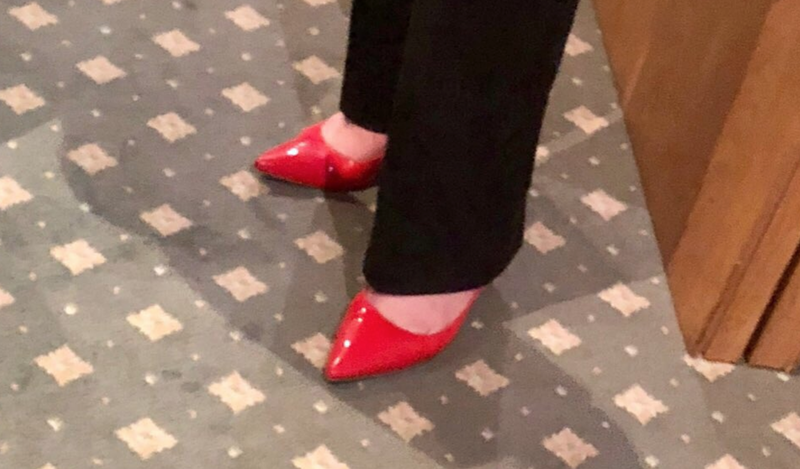 She also wore her new Rosebud kitten heels from Russell & Bromley. 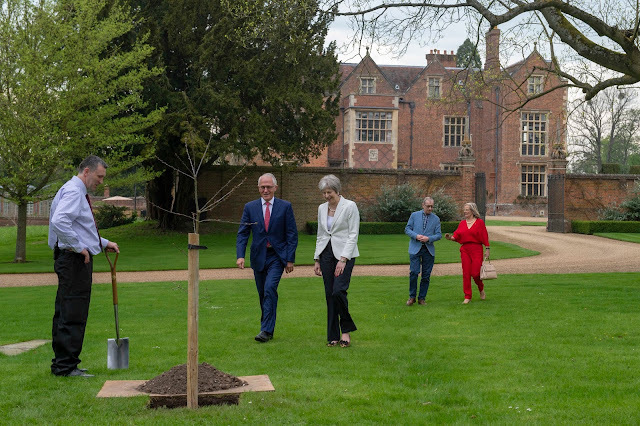 Spring has officially sprung, and Theresa May wore a fantastic new Amanda Wakeley dress to mark the occasion last week! 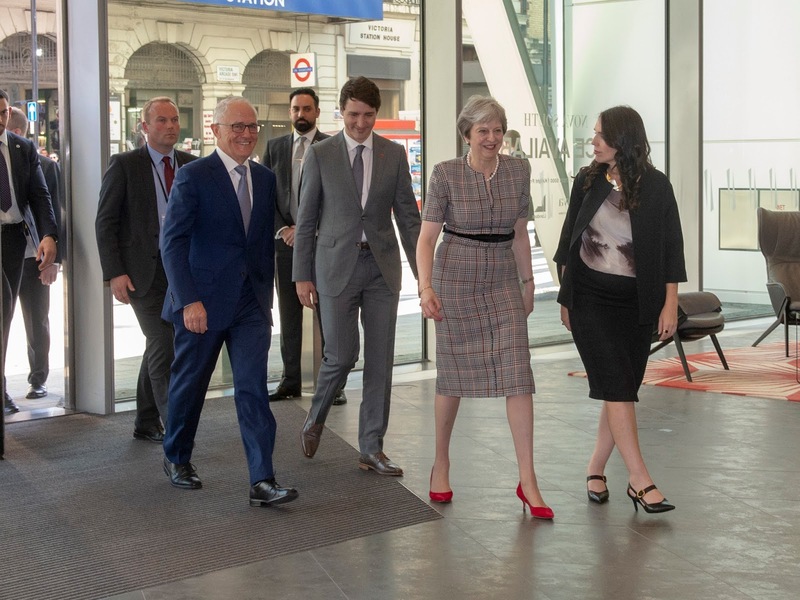 The PM selected the Prince of Wales check fitted dress by the legendary British designer to wear to a visit to the National Cyber Security Centre as part of the Commonwealth Heads of Government Summit in London. Perfect for the seasonal weather, the long shift dress is constructed in the classic charcoal Prince of Wales check, and revitalised with streaks of clementine for a striking look. 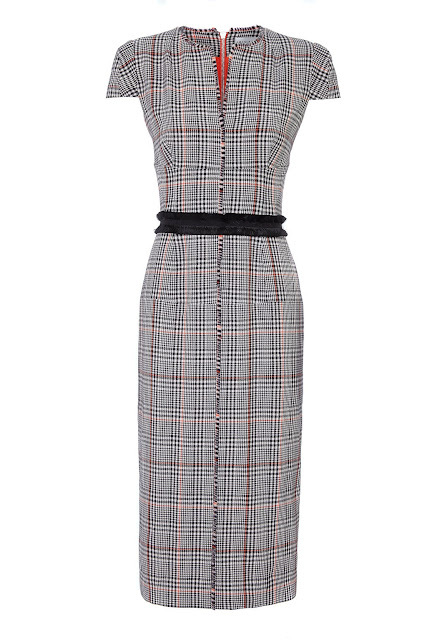 Tailored to nip in the waist and flatter the silhouette, it features a ruffled organza belt to cinch and define, as well as capped shoulders and a cut out neckline. 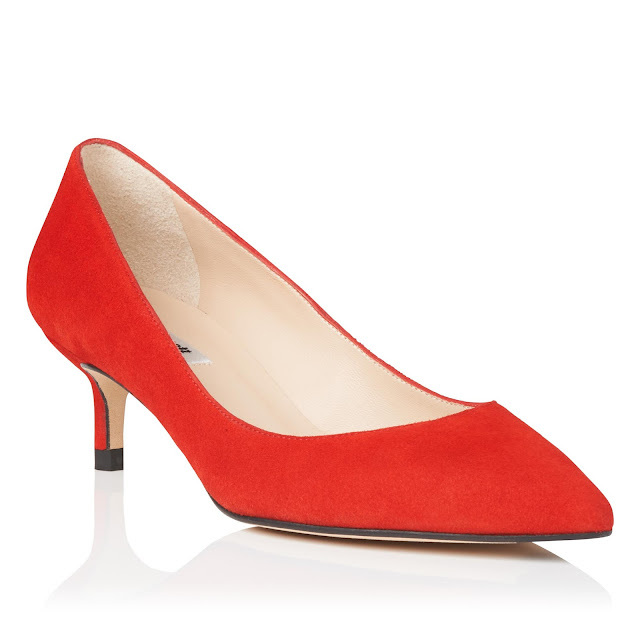 The PM referenced the neon streaks with a golden flame red pair of suede kitten heels from LK Bennett. And good news as these are currently on sale! 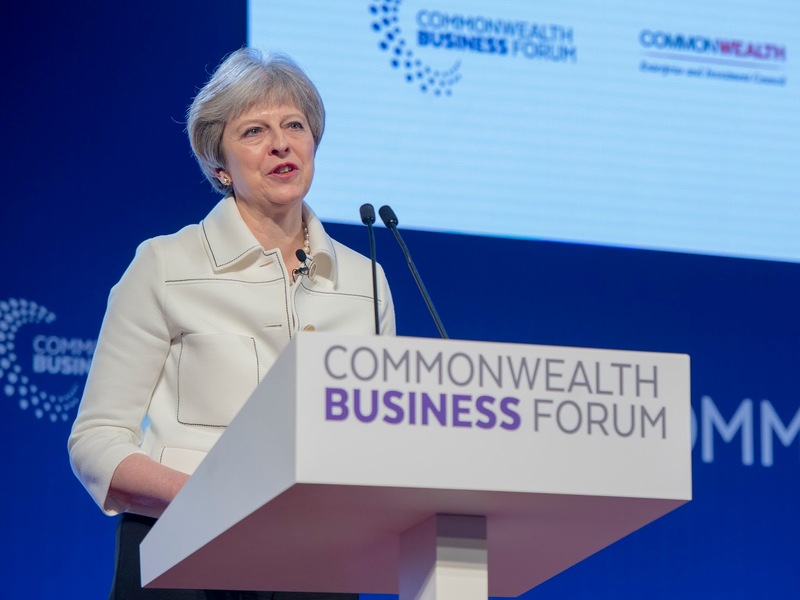 Later in the Summit, May wore the newly updated rose gold chunky chain bracelet with black ribbon teaming it with the matching necklace. 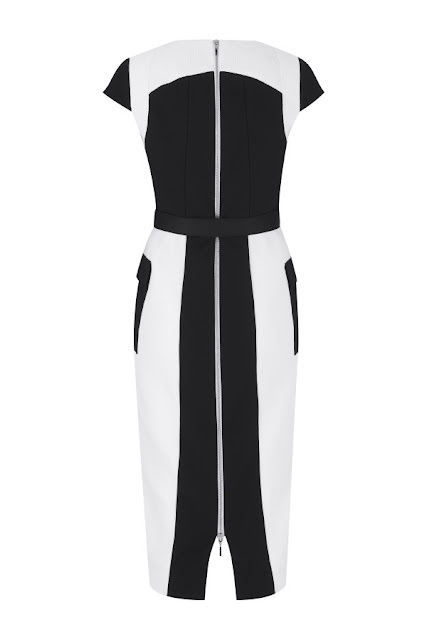 These accessories form the staple of Wakeley's collection are are perfect from taking a look from day to night. And the PM surprised us all on Saturday night, wearing a fabulous new Amanda Wakeley dress to the Queen's Birthday Concert at the Royal Albert Hall. 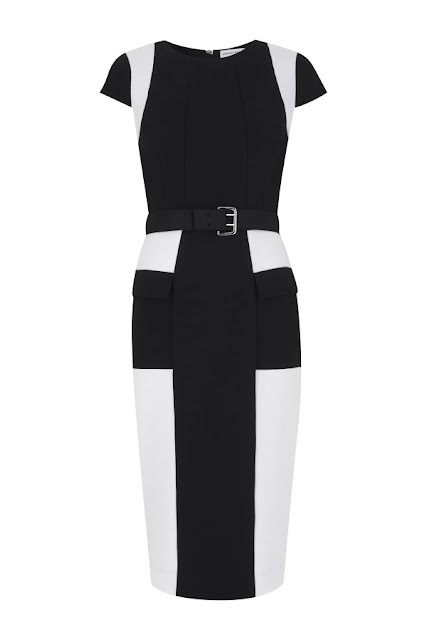 Debuting the shadow ecru pocket dress, the innovative bonded cady design has contrast panels and features statement pockets and zipped detail through the back that adds to the sports luxe style of this piece. It's definitely a daring choice for May- and we love it! 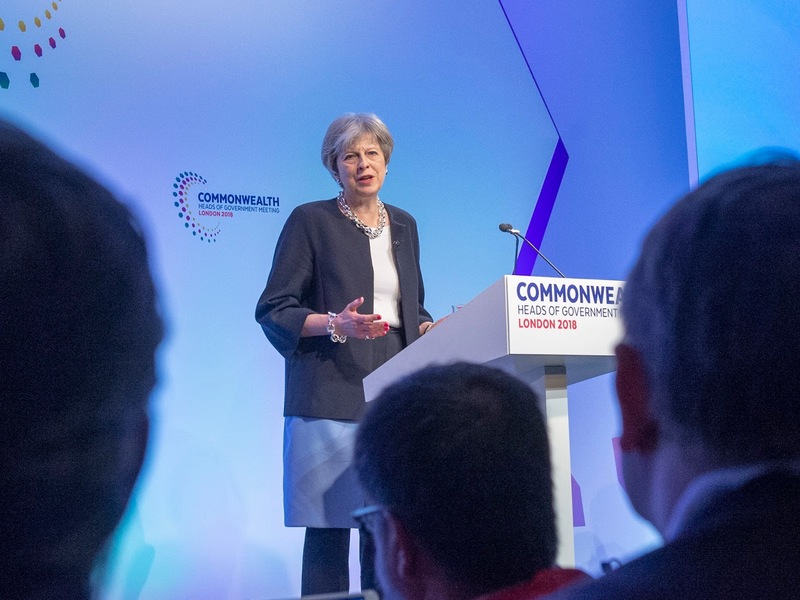 The Commonwealth Heads of Government summit rolled into London this week - here's a recap of Theresa May's week as host! 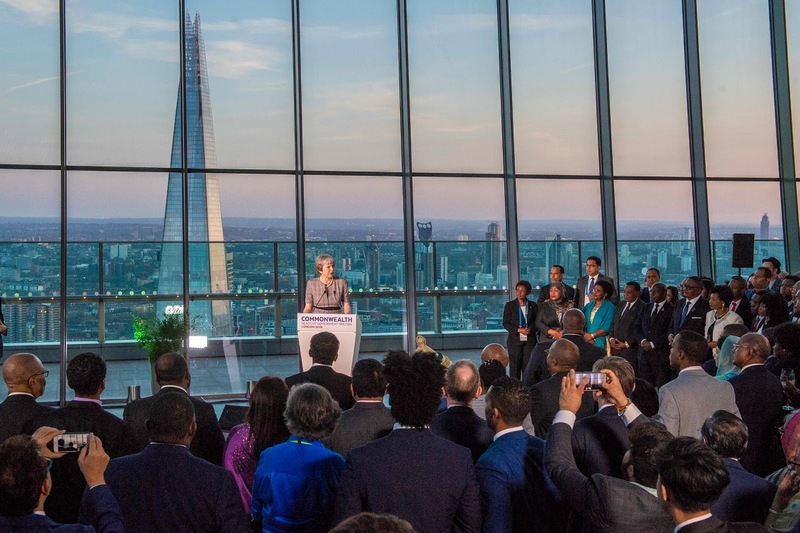 On Monday, the PM attended the Commonwealth Youth Forum and the Commonwealth Business Forum at Guildhall. May wore her white scuba Piazza Sempione jacket with black trousers and the Divine flats from Russell & Bromley. 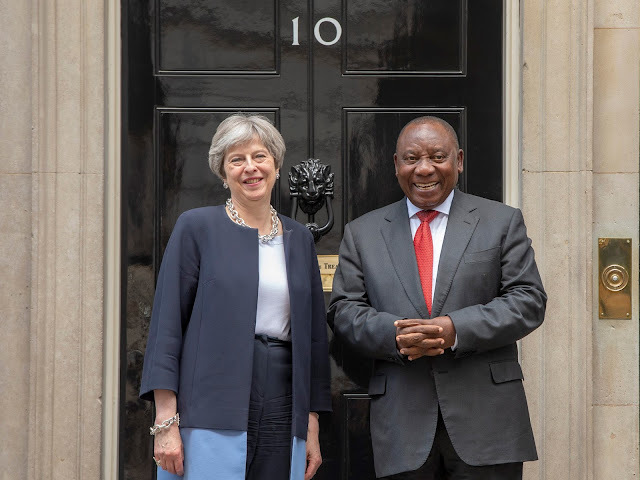 Later in the day, the PM welcomed the Nigerian Prime Minister to Downing Street. 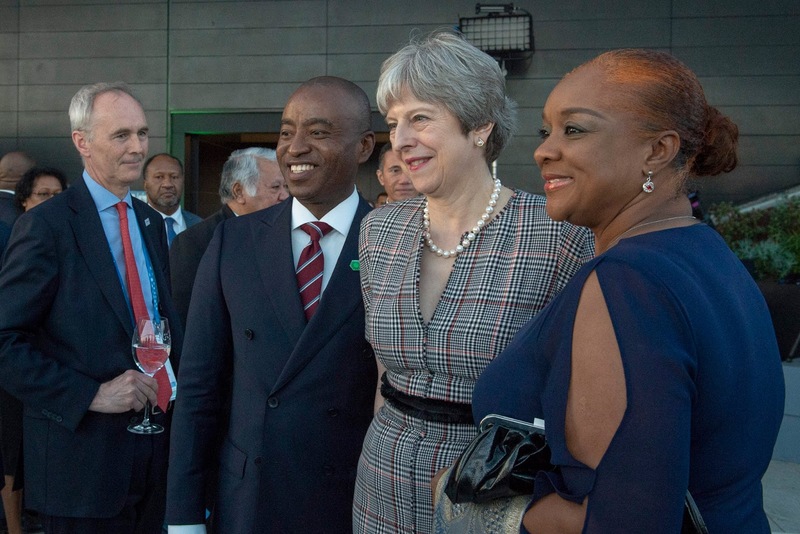 On Tuesday, Theresa May welcomed the Jamaican Prime Minister to Number 10, as well as addressing the Joint Forum Plenary. She also met with Bill Gates, held a South African Bilateral and a meeting about Windrush at Downing Street. 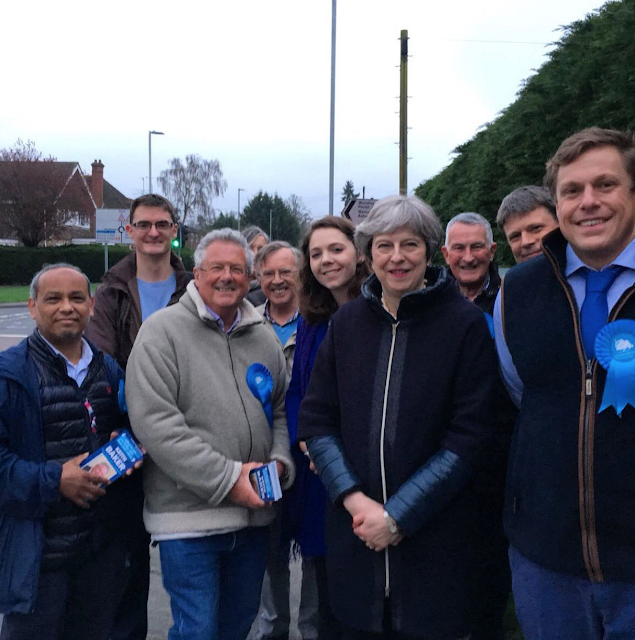 May wore her navy and sky blue long jacket from Amanda Wakeley with navy trousers and the leopard Frame flats. 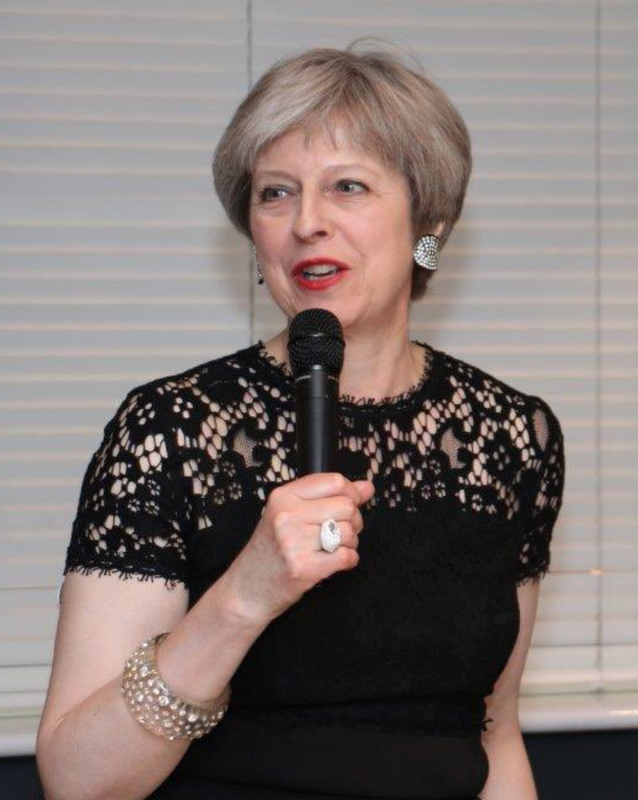 She accessorised with the Amanda Wakeley oversized silver chain necklace and bracelet and her new Celtic Treasure swirl ring. On Wednesday, the PM attended Prime Minister's Questions alongside welcoming Commonwealth leaders to Downing Street. 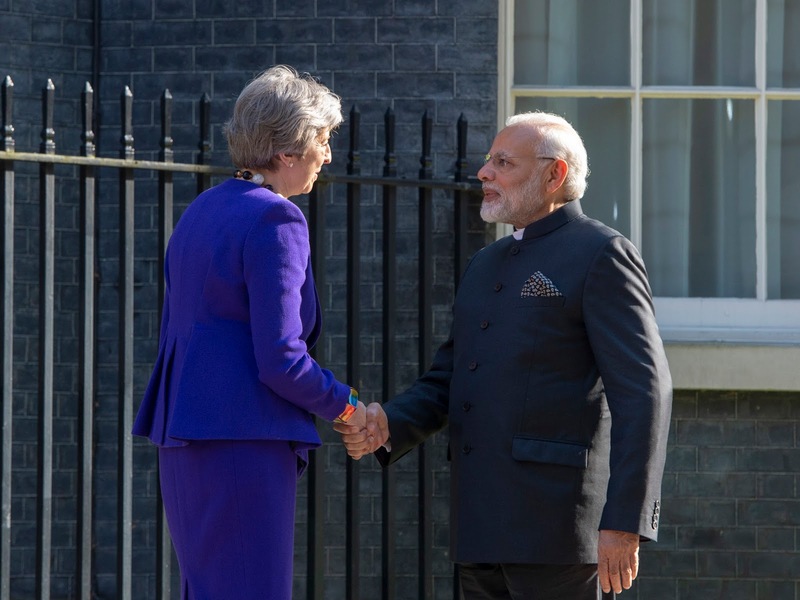 Prime Minister's Modi, Trudeau and Ardem all visited Number 10. 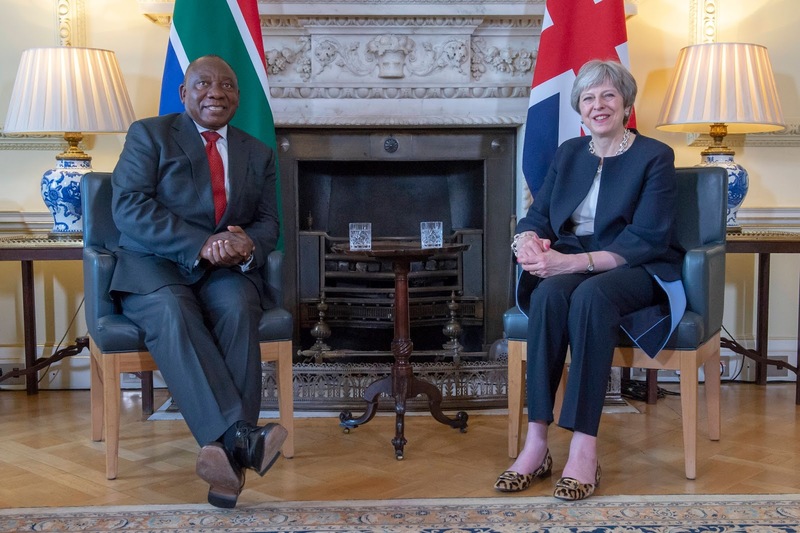 For this part of CHOGM, May wore her purple wool Orchid skirt suit from Daniel Blake, teaming it with her leopard Charlotte Olympia Kitty heels and a black and white bead necklace. Later in the day, May visited the National Cyber Security Centre with Prime Minister's Turnball, Trudeau and Ardem and hosted a reception at the Sky Garden. 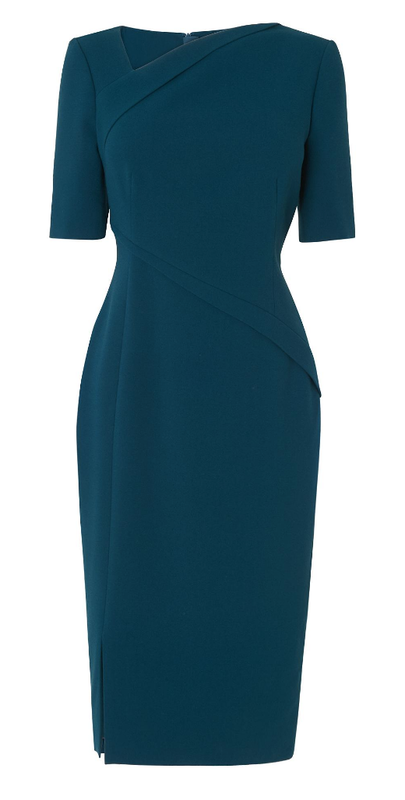 She wore a fabulous new dress from Amanda Wakeley- the Prince of Wales check fitted dress, teaming it with a pair of new red suede kitten heels from LK Bennett. 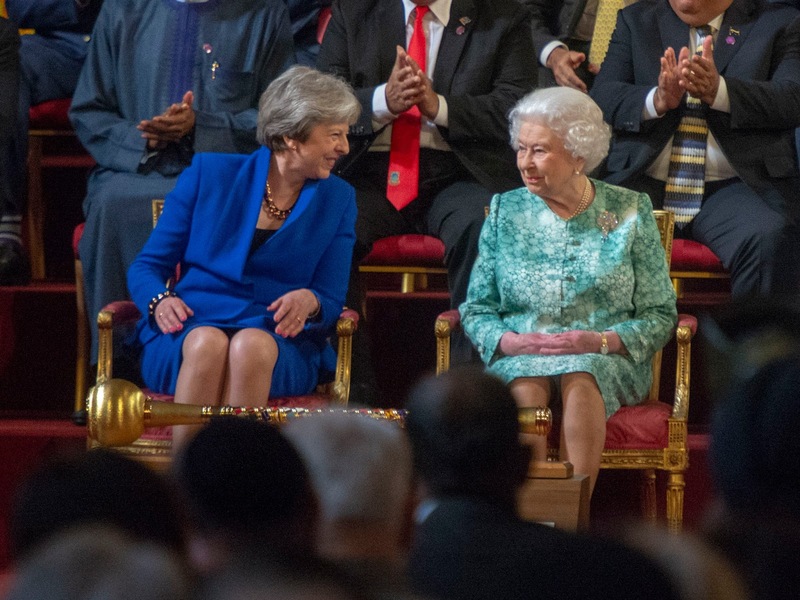 On Thursday, the PM attended the Formal Opening of CHOGM at Buckingham Palace. 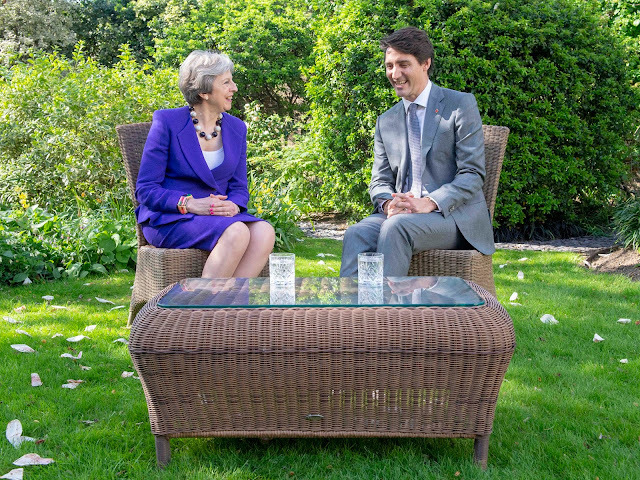 May later chaired the meeting. For this part of the day, May wore her blue wool Origami skirt suit from Daniel Blake, and debuted a new pair of kitten heels- the pale blue Rosehips from Russell & Bromley. May also accessorised with her new rose gold Amanda Wakeley chain necklace and bracelet. 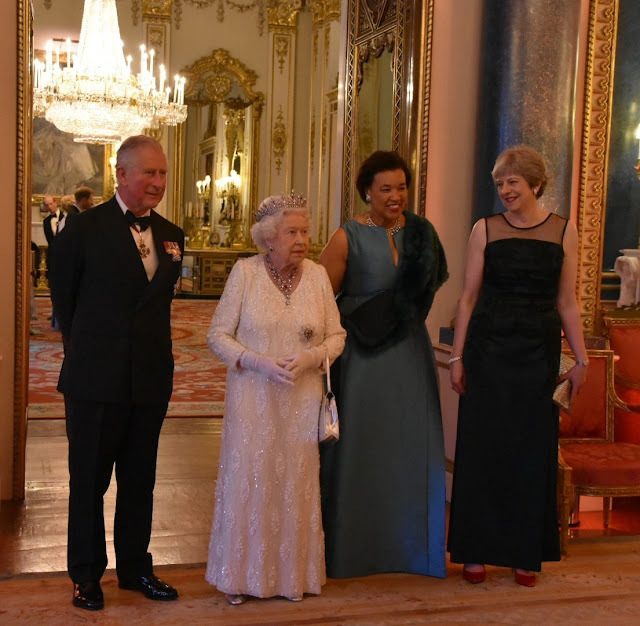 On Thursday night, the PM and Mr May attended the CHOGM Dinner at Buckingham Palace. May wore her dark green and black beaded sleeveless evening gown, accessorising with Swarovski jewellery, the silver Valorie clutch by Anya Hindmarch and a pair of red patent heels from LK Bennett. 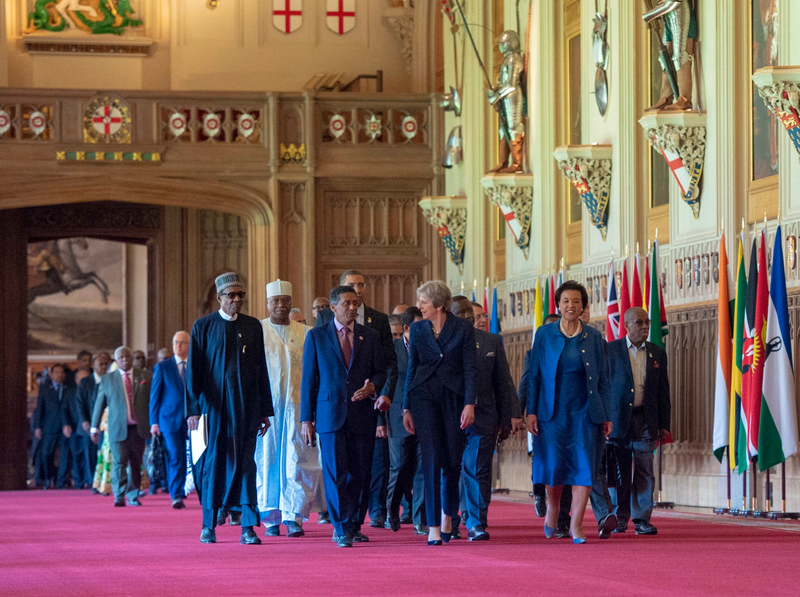 On Friday, May hosted the final day of CHOGM at Windsor Castle. 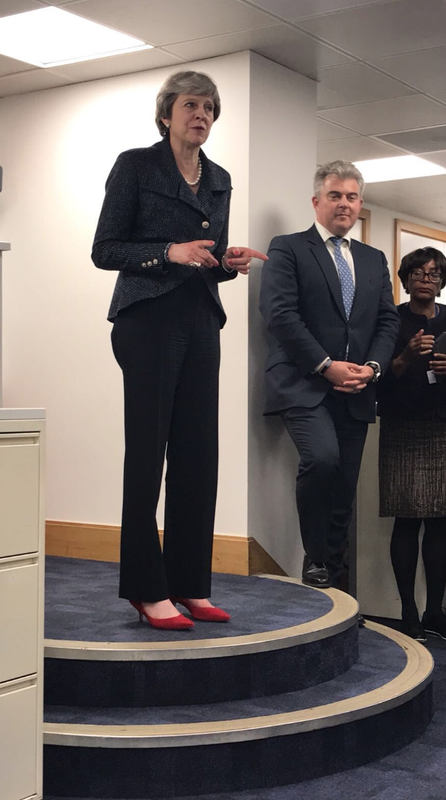 She wore the navy fleck jacket from Daniel Blake with navy trousers and a pair of navy kitten heels from Russell & Bromley. May accessorised this sleek outfit with a strand of pearls and the double cuff Swarovski crystaldust bracelet. On Saturday, May hosted Australian Prime Minister Malcolm Turnbull and his wife Lucy at Chequers. Turnbull planted a eucalyptus tree in the grounds of the estate. May wore a great spring outfit- a bright white blazer from Peserico, black trousers and the leopard Delicious flats from Russell & Bromley. From meeting with world leaders in Sweden and Denmark to announcing further investment in cancer services, here's a recap of Theresa May's week. 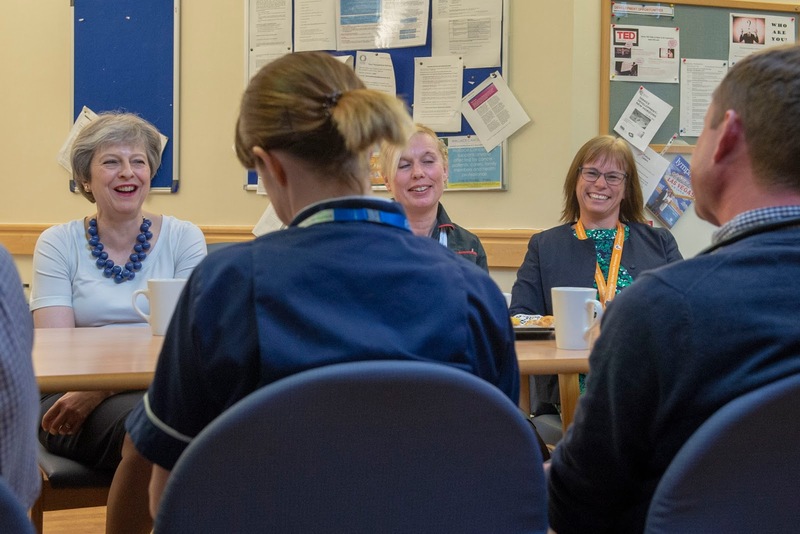 On Monday, May flew to Sweden and Denmark, holding bilateral talks with her counterparts. 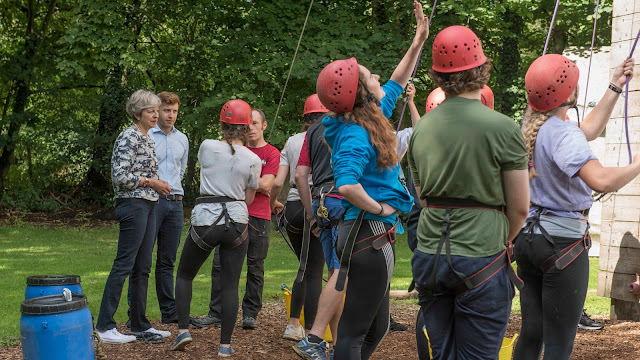 May wore her new navy and silver Daniel Blake jacket for the trip, teaming it with trousers and the Divine flats from Russell & Bromley. She accessorised with the silver Balls necklace and bracelet from Mirta Bijoux. 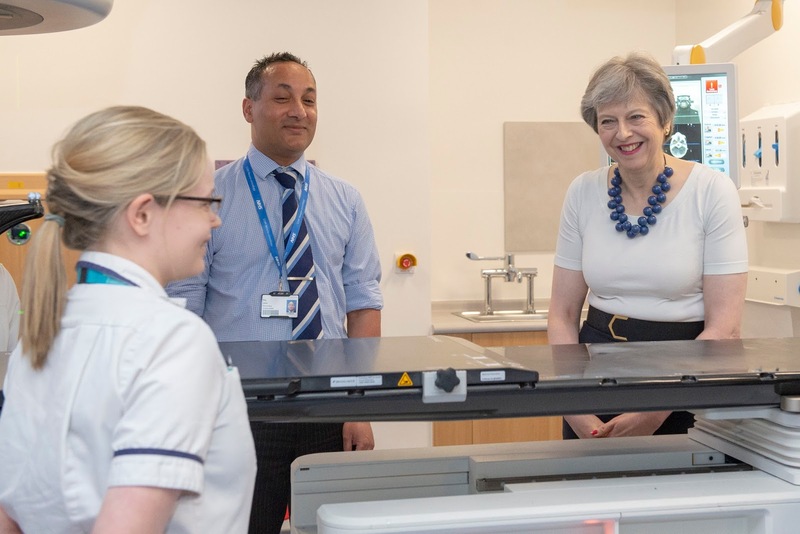 On Tuesday, the PM visited Addenbrooke's Hospital in Cambridgeshire as part of an announcement for further investment in prostate cancer treatment. May wore a navy skirt suit from Escada, accessorising with the blue Balls necklace from Mirta Bijoux and the leopard Kitty heels from Charlotte Olympia. 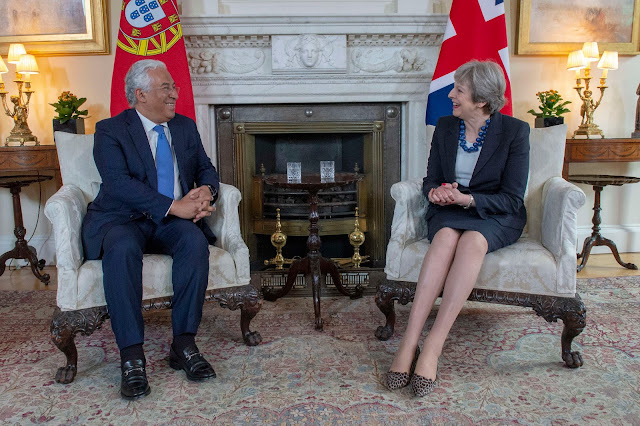 On her return to Downing Street, May welcomed Prime Minister Costa of Portugal. On Wednesday, Theresa May visited Birmingham's Alexander Stadium ahead of the 2022 Commonwealth Games to announce funding for the city. 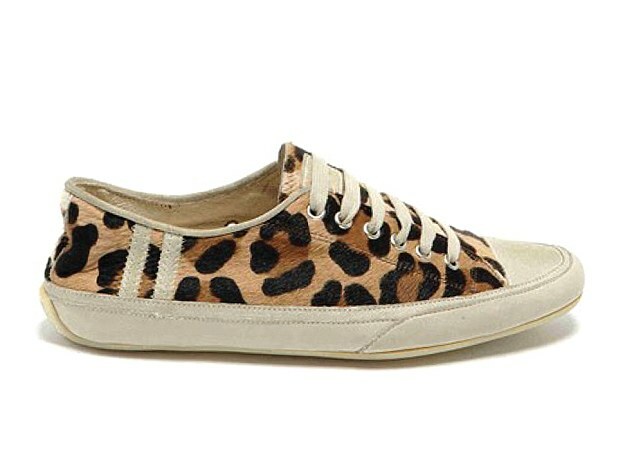 Proving that you can take part in sport in leopard flats, May chose the Frame shoes from Russell & Bromley for her trip. 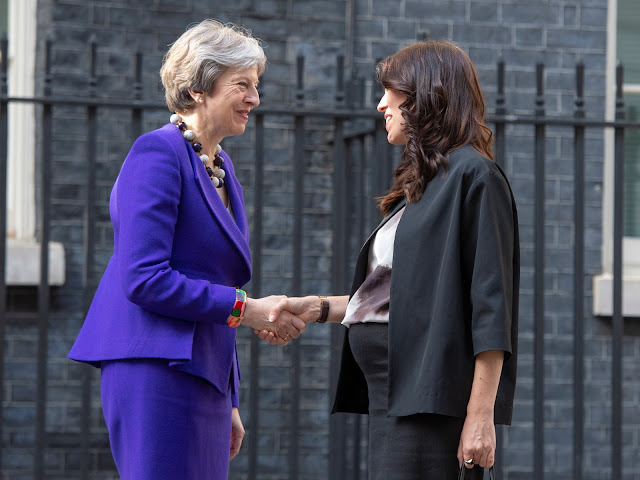 She wore her black textured Daniel Blake jacket with trousers, her Amanda Wakeley chain necklace and bracelet and her Herno jacket. 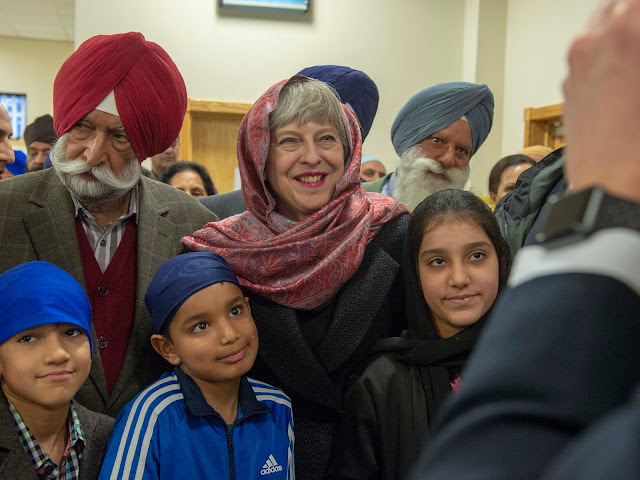 Later in the day, May visited Guru Nanak Sikh Gurdwara in Walsall. 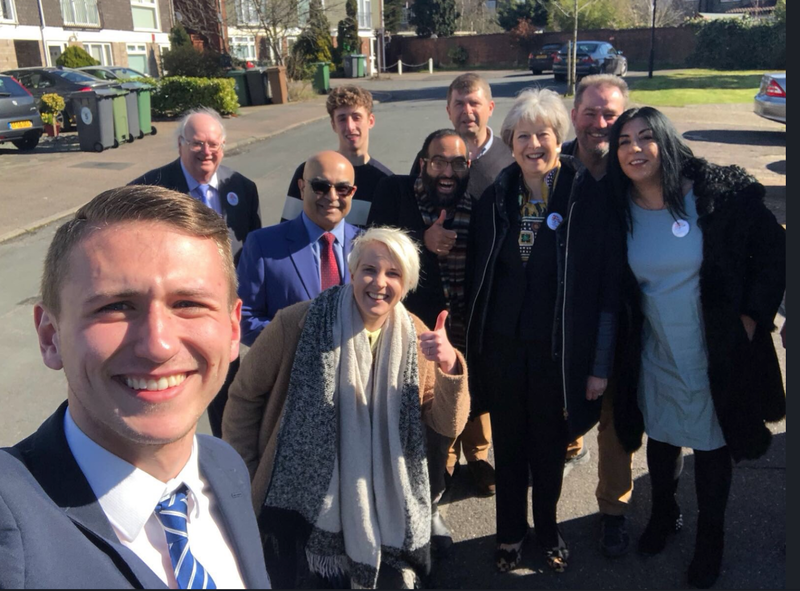 And on Thursday May was back canvassing for the local elections following meetings at Number 10. 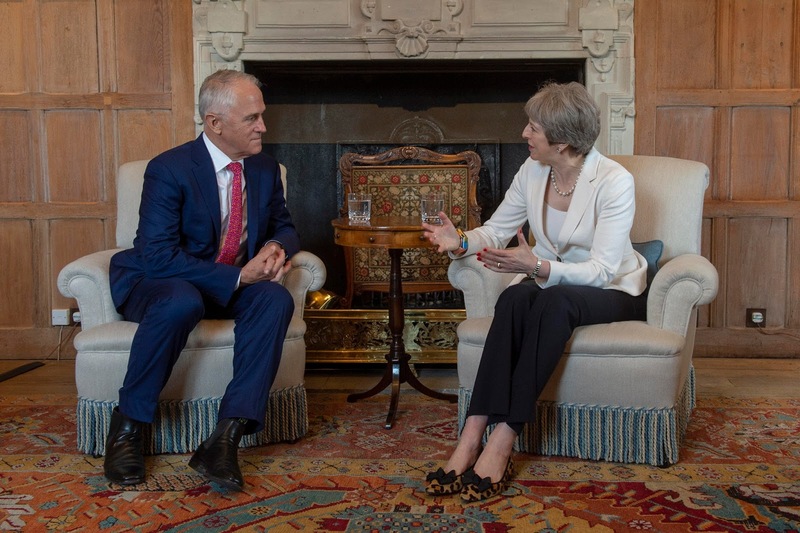 On Saturday, the PM delivered a statement from Number 10 about the air strikes in Syria. 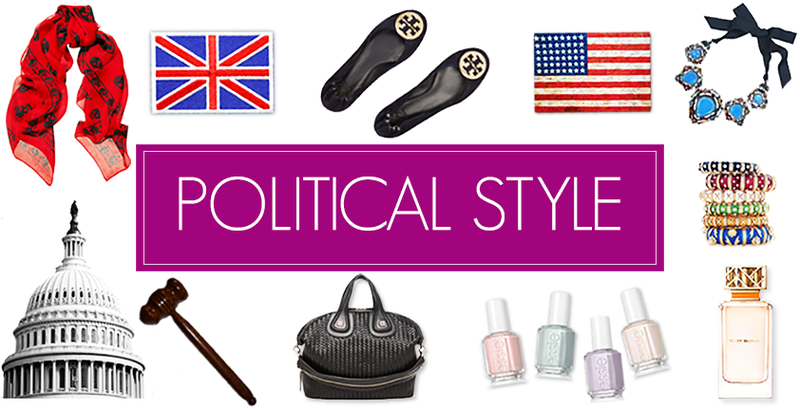 With the popularity of athleisure, there's no reason why sneakers can't be as fashionable as a pair of flats or high heels! 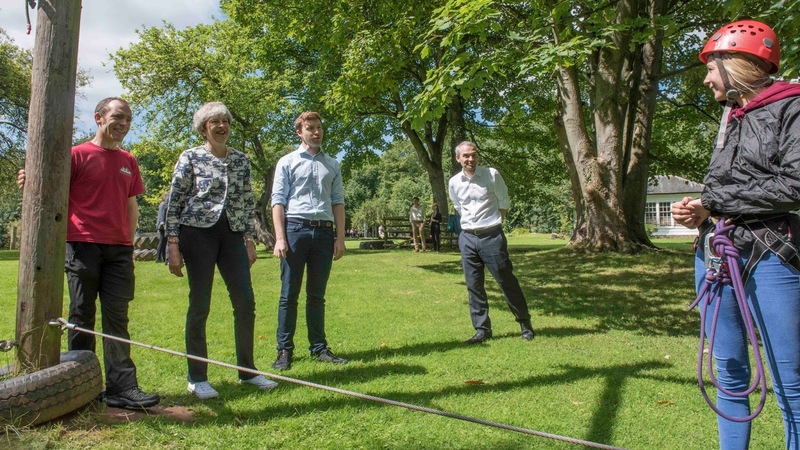 Theresa May is known for her love of fancy flats and kitten heels, but her sneakers are equally as cool. First up, is a snazzy leopard pair from Emma Hope. 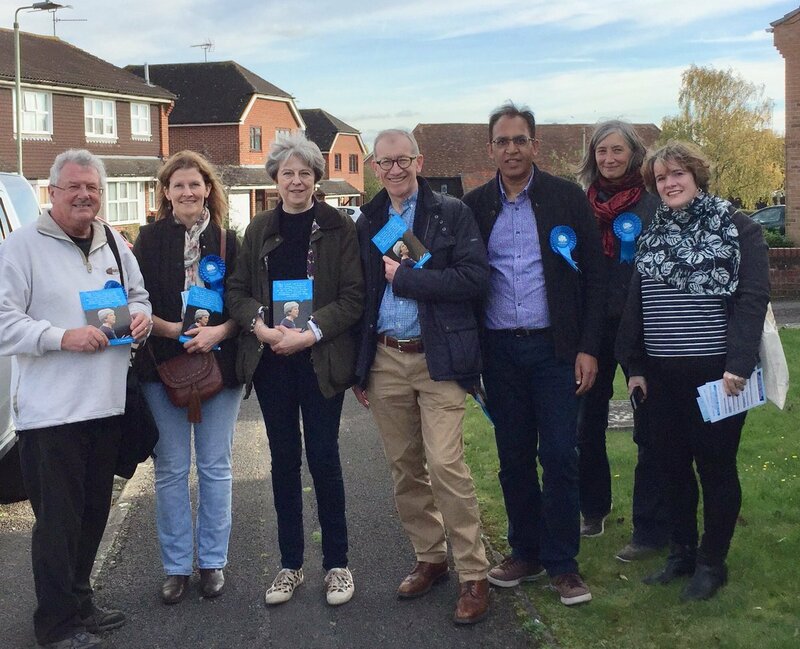 The PM has had these for a few years, and typically wears them when out canvassing. A great choice! Her second super sneaker is this very patriotic Union Jack pair. 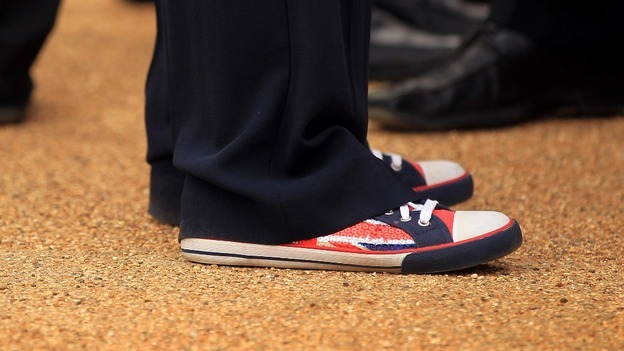 Similar to Converse, the PM wore these whilst attending the World Rowing Cup in Eton Dorney in 2013. Bring these back! And her most recent sneaker purchase? A pair of classic white Converse for her Italian summer holiday last year. May also wore them on a visit to Wales. 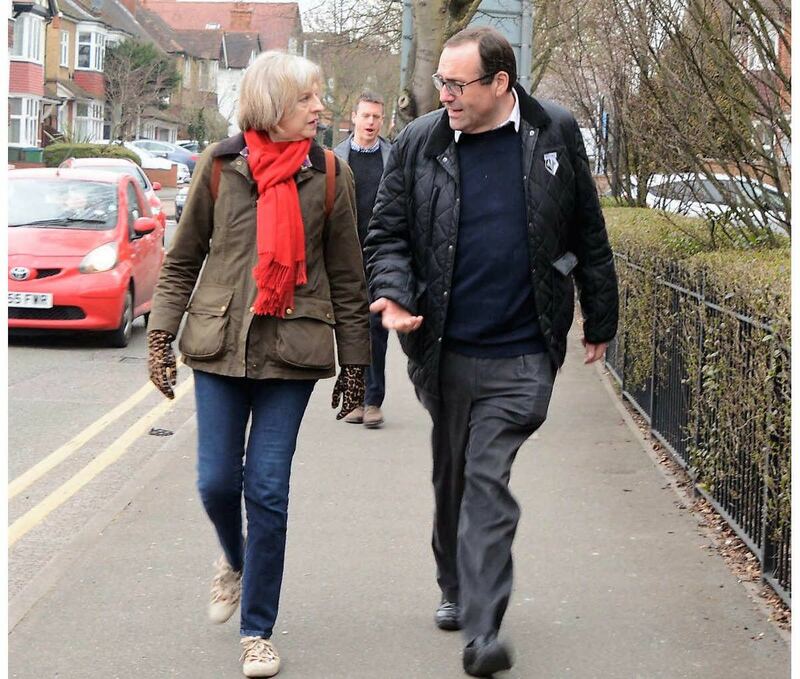 Theresa May was rightly on her Easter break this week- walking in Wales! 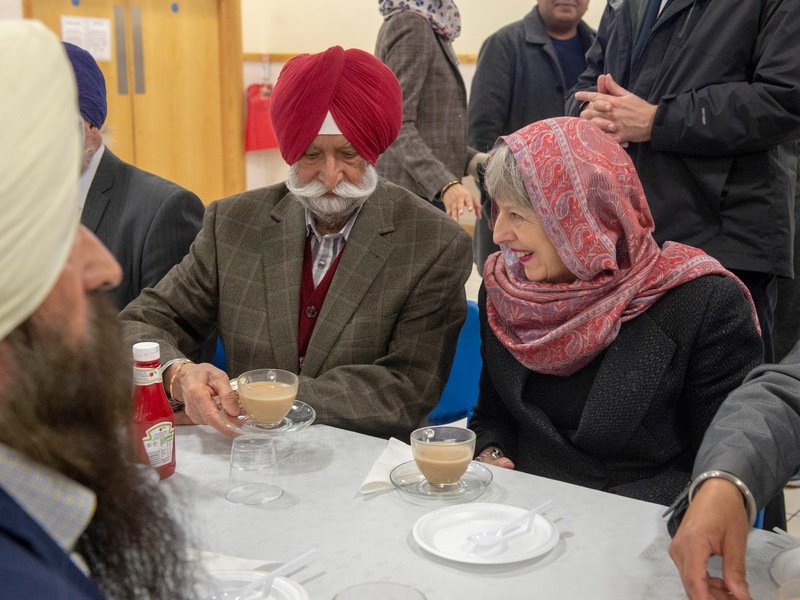 But she did join in with some local election campaigning in London on her return. Out and about in Chingford, the PM knocked doors with activists. She also debuted a fancy new scarf, teaming it with the Delicious leopard flats from Russell & Bromley, a sophisticated black jacket and trousers and her Herno jacket. 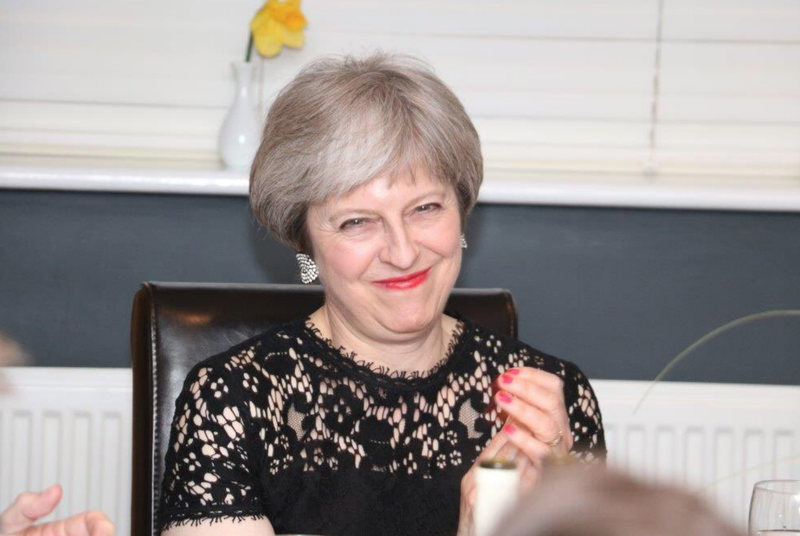 And on Friday, May attended the Maidenhead Association dinner. Looking glam in her black lace jumpsuit and sparkly accessories, May wore her patent red LK Bennett kitten heels to complete the look.